A song about celebrating Matariki. A family wakes early to watch the Pleiades rise in the North East, and then during the day, whanau arrive with food to share. 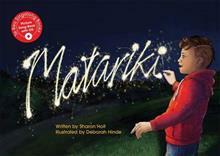 At last, a new Matariki picture book for teachers, parents and children to enjoy during Maori New Year celebrations. The newest book in the popular award winning Te Reo Singalong series follows a family through their Matariki celebrations over the course of a day. The family wakes at dawn to see the Matariki star cluster and the book takes the family as visitors arrive for a traditional Matariki feast. As the evening draws in, the children create their own stars using sparklers. Each Te Reo Singalong book includes a song CD, English translation, guitar chords and extension ideas. This book also includes information about Matariki. The song CD makes the book easy for everyone to enjoy and the simple, repetitive sentence structure in this book teaches the phrase "I like the...". You will love the gorgeous illustrations and the beautiful song. Te Reo Singalong books won the Best Resource in Te Reo Maori. Author Sharon Holt worked as a teacher and journalist before remembering her childhood dream of becoming a published children's author. Since the age of 40, she has had about 35 books, stories, poems and plays published. One of her books was a finalist in the NZ Post Children's Book Awards in 2007. Since 2012, she has worked full time writing, publishing, marketing and selling her Te Reo Singalong series which make it fun for teachers and children to use te reo Maori sentences with ease.